John Dempsey, born July 31, 1947, passed away peacefully at home and was discovered on May 15, 2015. 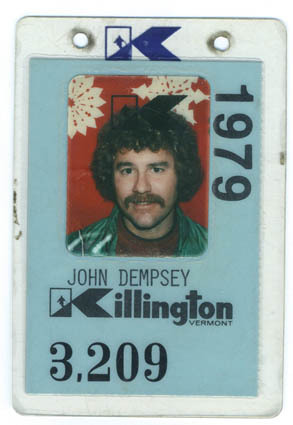 Dempsey was born in Seattle, then lived in Framingham, Mass., and Killington, Vt. Son of the late Robert and Marie Dempsey, he is survived by sisters Danielle Glimcher and Mary McConnell, nieces Tracey Cadima and Kim McConnell, nephews Brian Glimcher and Tom McConnell and grandnephews Kenneth and Kevin Cadima. He was especially a beloved brother to Danielle Glimcher and uncle and best friend to Brian Glimcher. He was also a friend to many skiers young and old in the Killington area. Dempsey’s passion was skiing in the winter and biking in the summer. He also enjoyed kayaking and hiking in the Killington area. He had a wonderful sense of humor, a heart of gold and was a truly good person. John Dempsey graduated from Framingham High School 1965, went on to Wentworth College and then Northeastern University, graduating in 1970. He became a highly trained engineer working on projects around the country. Service plans are have not yet been finalized. Condolences may be emailed to his sister Danielle, dglimche1@gmail.com. Memorial donations may be made to Vermont Adaptive Ski & Sports. The Killington community will miss you dearly, Johnny. May the clouds in heaven be yours to ski for eternity.